We invite you to register for the pre-sale to get priority booking over the general public. This does not obligate you to any payment, it simply gives you the chance to book before the general public on-sale starts. 2017 311 Caribbean Cruise ALUMNI were automatically assigned an Earliest Booking Time and sent details via email on Wednesday, May 30th. This group will be able to book as early as Thursday, June 14th. 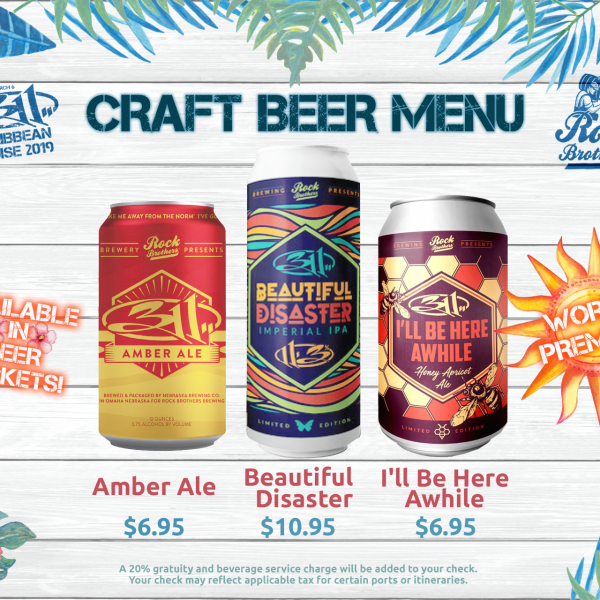 311 Caribbean Cruise ALUMNI WHO DIDN'T SAIL IN 2017 will need to join the pre-sale by Thursday, June 14th. This group will be emailed an Earliest Booking Time by end of day Friday, June 15th and will be able to book the morning of Tuesday, June 19th before guests who are new to 311 Caribbean Cruise. GUESTS WHO HAVE NOT SAILED YET should register by Thursday, June 14th and will be emailed an Earliest Booking Time by end of day Friday, June 15th and will be able to book as early as 2:00pm ET on Tuesday, June 19th. Guests who register for the pre-sale after Thursday, June 14th will be emailed an Earliest Booking Time by end of day Thursday, June 21st and will be able to book on Friday, June 22nd before the public on sale starts. The pre-sale ends at 4:00pm ET on Friday, June 22nd. The general public will be able to book a stateroom starting at that time.